Flights from London, Paris and Amsterdam are among those grounded amid fears about the survival of India's largest private airline. 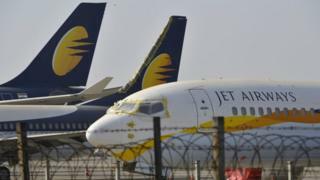 Jet Airways is saddled with more than $1bn (￡765m) of debt. It is seeking a financial lifeline to avoid collapse and, on Thursday, grounded 10 planes over unpaid fees to leasing firms. The airline flies on 600 domestic and 380 international routes - but carriers in India must maintain a fleet of least 20 aircraft to continue to operate international services. It said it "regrets the inconvenience caused" to its passengers and was "working to minimise guest inconvenience". "In parallel, the airline's management and its key stakeholders including its consortium of lenders, continue to work closely towards resolving the current situation," it said. Sandeep Kooner and her three children had been expecting to be on a flight from London to India on Friday evening to attend her niece's wedding in Punjab. "I had just sat down in the nail salon when I got a text message to say my flight had been cancelled," she told the BBC. She has now arranged to fly with Air India, but that will be days later and to Delhi - an eight hour drive to her destination - rather than a local one. "I'm not 100% sure my problem is 100% sorted," she says. Television channels in India reported that the prime minister's office had called for an urgent meeting to discuss the airline. India's Aviation Minister, Suresh Prabhu, had tweeted that his ministry would "review issues related to Jet Airways" and "take necessary steps to minimise passenger inconvenience and ensure their safety". The pilots union in India is planning a protest on Saturday and has written to the airline demanding that employees are paid. Staff of the airline were pictured by Priyanka Iyer of Business Television India marching to the company's headquarters in Mumbai. Ellis Taylor, deputy Asia editor of Flight Global, told the BBC the airline was in a "precarious position". "The interim lifeline that the carrier talked about two weeks ago looks like it won't materialise any time soon, and that really leaves its future looking bleak," he said.